The conservation of Alaska’s fish and wildlife resources depends on education! From continuing responsible participation in our outdoor traditions such as hunting, fishing and trapping to helping create informed and active citizens through environmental literacy, educators play a key role in promoting the conservation and sustainable uses of Alaska’s fish, wildlife and habitats. The Alaska Department of Fish and Game maintains a wealth of resources to support 'place-based' learning in classrooms, at home and other experiential learning environments throughout the state. Whether you live in an urban center or a rural village, we offer a wide range of locally relevant materials and programs. We also recognize that educators come in many forms and classrooms aren’t just in schools. If you work with a youth group, teach at a culture camp, volunteer with an outdoor or conservation organization, are a parent, grandparent or caregiver, you are an educator too! We encourage you to explore what we have to offer and contact us with any questions. Teacher Resources: Explore these pages for curricula, classroom presentations and more. 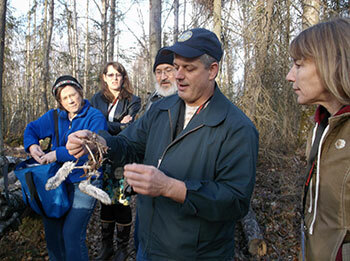 Teacher Training/Professional Development: Let us demonstrate how to incorporate outdoor skills and wildlife lesson plans into your classroom with materials aligned with the state standards. Several courses can be taken for teacher recertification credits. Early Childhood: Early childhood is a key time for connecting children with nature. Learn about our programs and resources geared for young children. Training for care-givers and teachers is also available. Educational Permits: Some classroom activities, such as collecting skulls or sampling invertebrates, may require a permit.